Donald Trump speaking at CPAC in Washington, DC. Photo by Gage Skidmore. What should the next president do about the Islamic State? The Republican candidates have offered strategies with varying degrees of specificity and pugnacity. Setting aside questions regarding the long-term trajectory of his presidential campaign, Donald Trump’s recent appearance on Meet the Press drew headlines for, among other things, his explicit and characteristically blunt call to put American troops on Iraqi soil to combat IS. According to a recent poll, this position has the strong support of the American people. According to retired Lt. Col. John Nagl, who was on General Petraeus’s team that wrote the military’s counterinsurgency manual, defeating the Islamic State would require at least 15,000 Americans and a presence lasting at least a generation. Should Trump or another of the Republican candidates defeat the eventual Democratic nominee (Clinton, Sanders, and O’Malley have all dismissed the idea of deploying additional American ground troops) and move into the Oval Office in January 2017, large numbers of American forces may come to occupy territory in Iraq and Syria. But would the public support that currently exists evaporate when casualties began to mount? And would our elected leadership respond by changing course and withdrawing before stability and success is achieved? Should the United States come to occupy parts of Syria and Iraq, it might be worth exploring what existing academic research has to say about the prospects for success for states that find themselves in such circumstances. Following the withdrawal of American forces from Vietnam, a conventional wisdom of sorts exists in academic and policy circles suggesting that democratic counterinsurgent forces, with their impatient and casualty-averse publics, will find it difficult to achieve victory before support back home runs out (see here, here, and here). However, other recent scholarship has found that despite these arguments and assumptions, regime type plays no significant role in determining outcomes in counterinsurgency wars, and that democracies actually win these types of wars over fifty percent of the time. In a recent study at Conflict Management and Peace Science, I try to reconcile the conventional wisdom with these surprising findings using data from 70 counterinsurgency wars conducted by occupying powers between 1800 and 2005. I argue that regime type alone does not explain the results of these conflicts; rather, it is democracies’ sensitivity to wartime casualties that separates them from autocracies. My theory links the level of casualties suffered by an occupying force to its leadership’s decision to withdraw from the contested territory, giving up the goals that brought them there in the first place. Why? 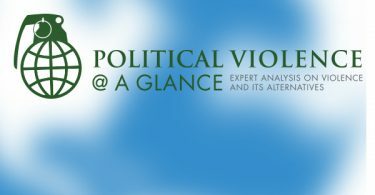 Opposing political elites seeking electoral gain will draw attention to the casualties, frequently arguing that the benefits that might come with continued fighting will not justify those costs, and that such wars are not necessary for the state’s survival. Once these divisions occur at the elite level, it becomes very difficult to maintain support among the population. To remain in office, leaders responsible for the war must change course and withdraw or they will be replaced by leaders who will. 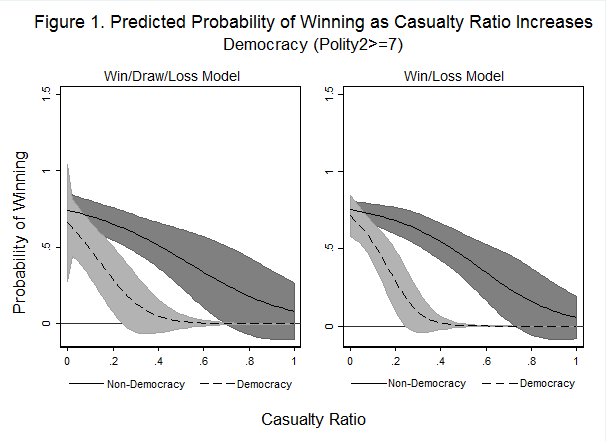 This leads to the finding that, though democracies do not win or lose occupying wars any less than autocracies, they consistently abandon them at significantly lower levels of casualties. In fact, as shown in the figure below, the chance that a democratic occupier will emerge victorious falls below 50% at a casualty ratio (again, force casualties/total forces deployed) of between 5% and 25%, depending on the model. This contrasts with autocrats, who do not fall below this threshold until achieving a ratio of between 25% and 75%. In other words, democratic states have tended to withdraw well before they lose the ability to continue fighting, while non-democracies appear much more likely to fight these wars until they are no longer capable of fielding an effective fighting force. 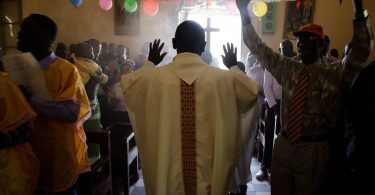 The struggles in Iraq and Afghanistan renewed scholarly interest in insurgency and counterinsurgency studies, and the availability of fine-grained data from both conflicts have allowed researchers to identify the operations and tactics that effectively reduced violent attacks against counterinsurgent forces. Such steps may mean fewer insurgents and, as a result, fewer combat deaths among American servicemembers in the future. At the same time, improvements in battlefield medicine and military technology (e.g., body armor, armored personnel carriers, etc.) mean that injuries that once might have been fatal no longer are. But should a new president decide to send soldiers, sailors, airmen, and Marines to defeat the Islamic State, those forces will meet a committed and vicious opponent and some will inevitably die in the fight. Most Democratic politicians, including the president and those vying to be his successor, have argued that while the Islamic State is certainly a threat to American interests, it does not have the capacity to threaten the security and viability of the state. As such, defeating it is not America’s responsibility alone, and it should not be American troops on the front lines. Republicans have suggested otherwise. Despite his willingness to tread down this same path, front-runner Trump, along with most of the other Republican candidates and one notable Democratic candidate, have all maintained that knowing what we know now, the 2003 invasion of Iraq should not have taken place. But these candidates claim that the errors that should have kept the United States out of Iraq had more to do with faulty intelligence regarding weapons of mass destruction, and less to do with the difficulties that followed the invasion. However, it appears from this research that another key lesson any future president should know before embarking on an occupation in the Middle East is that victory can be very elusive in the face of American casualties – even if relatively few – and a domestic political opposition arguing to the public that the war is not necessary. Matthew S. Wells is Visiting Assistant Professor of Political Science at Wabash College. 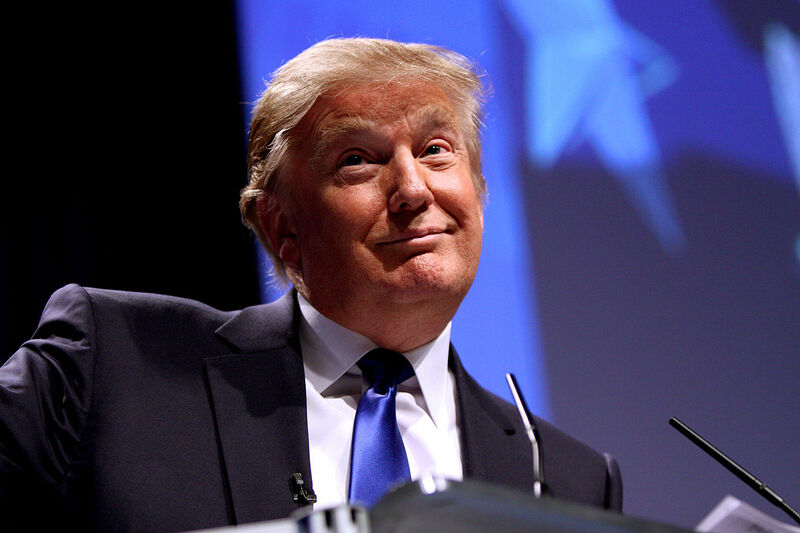 It is probably a mistake to confuse campaign rhetoric with policy and planning.